Here is a gathering of all the pertinent links for the Planet Comics serial Mysta of the Moon posted on Lady, That’s My Skull. The links are sorted per issue though sharp-eyed readers may notice the chapter headings do not match the links. This is due to my not noticing a few posts were deleted by the service before I entered new ones. So to avoid confusion just go by the post titles. In Planet Comics #35 Mars is waging a war against science and intellectualism when he crosses paths with Mysta and her brother. 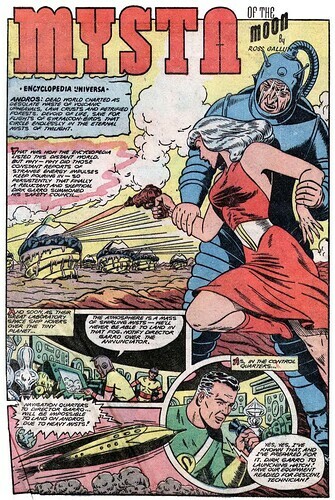 While this story details Mars’ greatest success, effectively destroying human civilization, it also marks the marginalization of the Mars character as the far more visually appealing Mysta is brought to the forefront as the protector and savior of humanity. 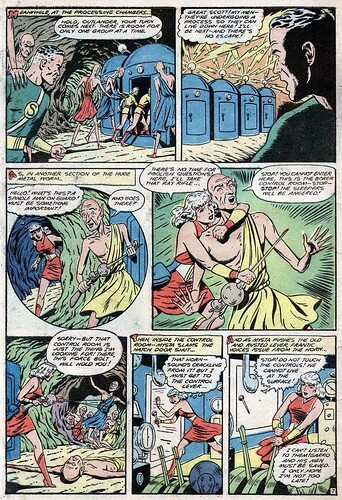 By the following issue Mysta headlined her own series and Mars was delegated to only a final cameo. 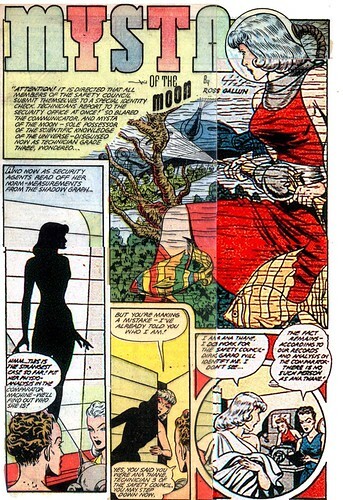 Out of all the female characters featured in Planet Comics it is Mysta of the Moon that was the strongest in terms of woman’s empowerment and characterization equal perhaps only to Futura, also a Planet Comics feature. 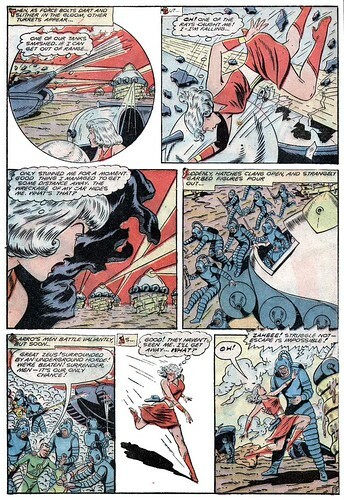 Unlike many other contemporary characters Mysta largely stood on her own in her adventures. 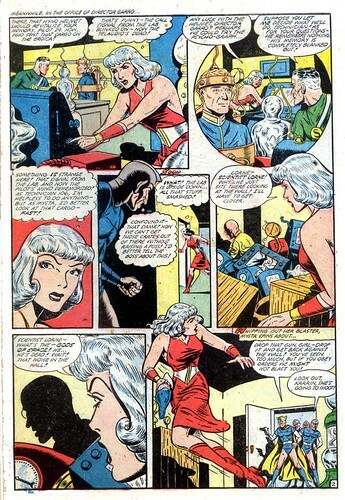 It was typical of almost any comic book tale of the era even where a female would be the lead in a story it was not unusual to have a man show up near the end of the tale and take charge, wrapping things up as the woman character shed angst-filled thought balloons expressing gratitude and unrequited love. 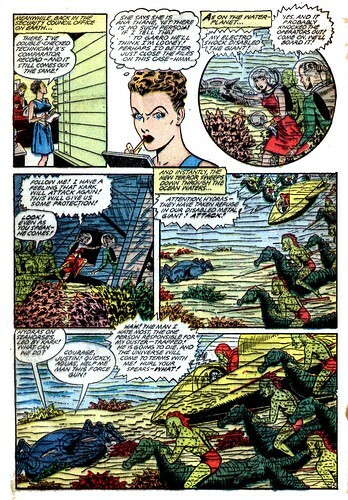 Among the Planet Comics entries this was most common among the Gale Allen serial. Mysta, being the most intelligent person in the Universe, would have none of that even though the creative team in the beginning used the “Diana Prince” trope and there is a greater than average amount of gratuitous cheesecake in the stories. 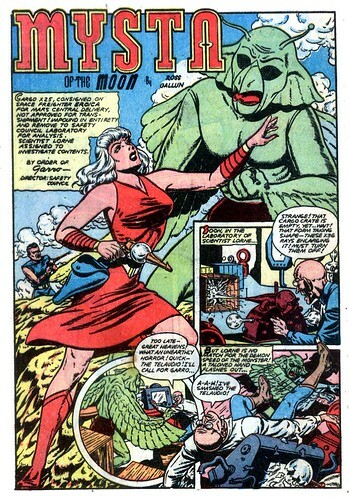 Anyone interested in researching a good example of early female empowerment in comic books could do worse than reading the Mysta of the Moon series. Further reading: Don’t forget to miss Michael May’s examination of Mysta of the Moon at Michael May’s Adventureblog! 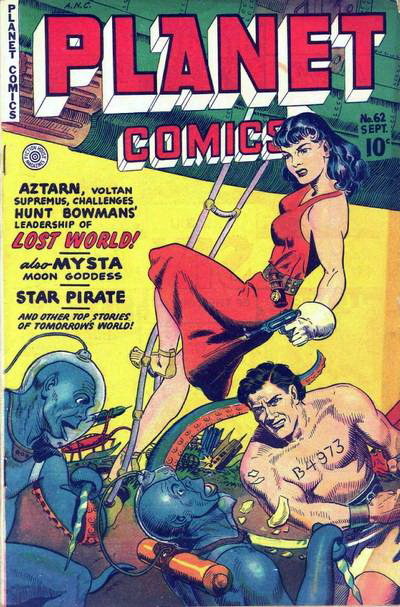 Planet Comics #62 (Sept 1949) is the final original Golden Age appearance of Mysta of the Moon. 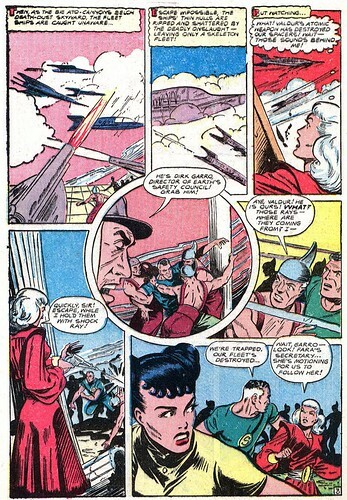 A stated previously, comic books and their content were changing and soon there would be little acceptance of grand, impossible space operas. The trend in newer storytelling would be just as bombastic and unlikely thematically but would be more acceptable in relation to what the public perceived as possible in science fiction tropes. 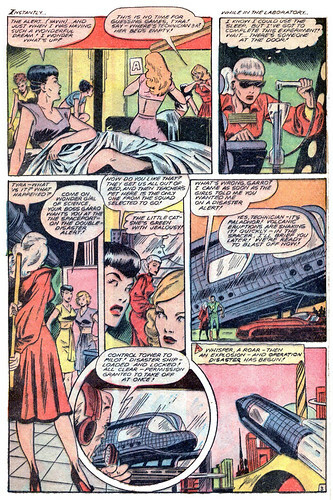 Film and television would have a great influence on the appearence and plots of science fiction comics thereafter. 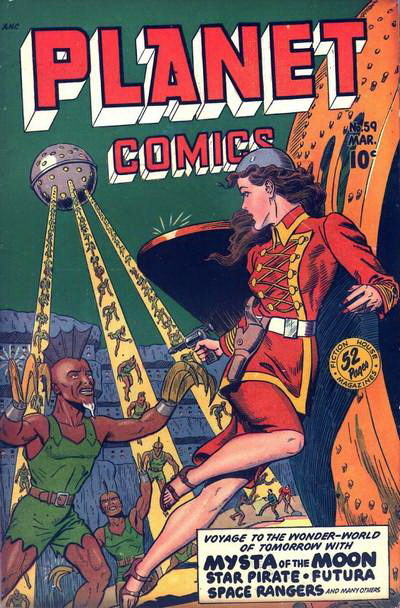 Planet Comics would mostly exist as a re-print anthology before ending in late 1953. 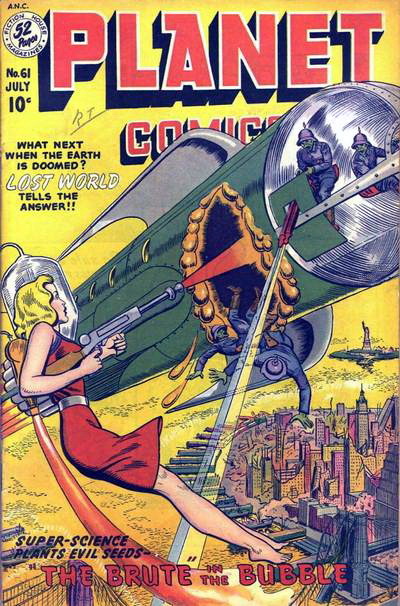 While the serials ended with somewhat of a quiet whimper Planet Comics went out with a bang. 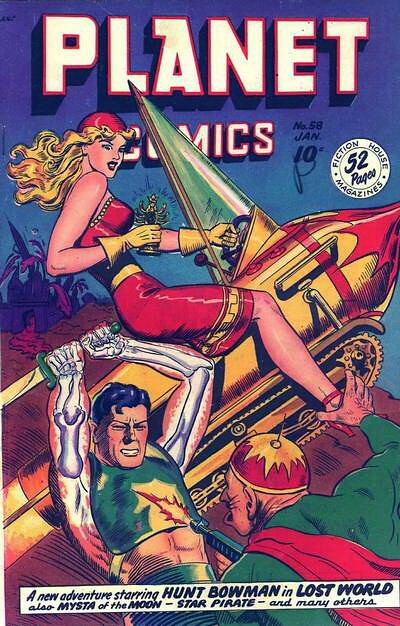 The cover to the final issue, #73 (Winter 1953) is a Maurice Whitman classic. 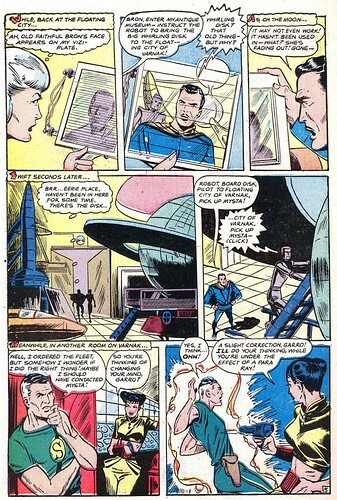 The lead feature, Cerebrex, is also no small accomplishment in both art and story. 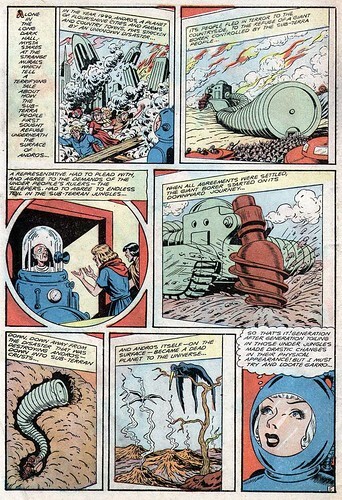 Cerebrex has been reprinted a few times over the decades and a few comic book blogs have also featured the tale of computer power gone right. The last Planet Comics issue featuring Mysta starts to shake up the status quo a bit as another technician begins to delve into Mysta’s true identity. For the uninitiated, Mysta is working undercover with the Safety Council, leaving behind her extra-planetary fortress and resident caretaker to live among humanity. The main plot is one typical of the last several chapters of Mysta and concerns a mutated race and the misuse of technology. It is a shame the series ended so abruptly because the subplot about Mysta’s identity was interesting. It showed a growth of characterization in the serial that the rather disposable nature of the medium of the era was often bereft. This chapter of Mysta of the Moon is shorter by one page than previous entries. 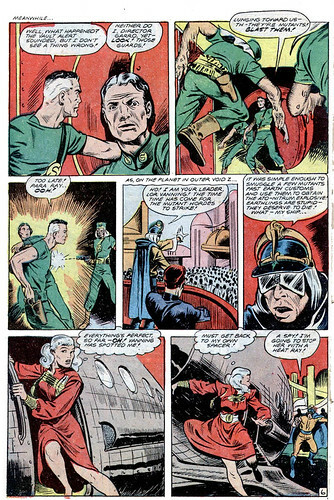 The Mysta feature is also the only one among the other serials that signed off with a definite if unsatisfying conclusion. All the other series simply promised to return next issue and often did not reappear. I speculate that the creative team knew this chapter of Mysta would be the final one and wrapped it up very, very quickly even though many plot threads remained dangling, particularly in regards to Bron, exiled to Mysta’s fortress moon. 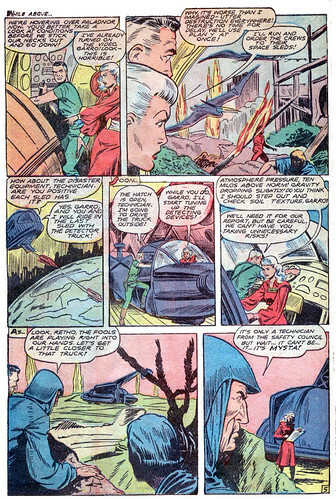 The final panel of the Mysta story depicts her breaking the fourth wall, an annoyed expression on her face. Indeed, throughout much of the story Mysta appears uncharacteristically bothered, unprepared and angry. In the final scene the reader is privy to her thoughts and she in effect communicates a final, perfunctory farewell to the audience. 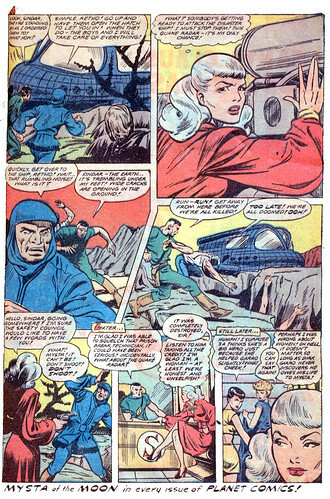 A text box in the panel displays the phrase ‘The End!’ something that the other serials did not include in their own final chapters. We may probably never know but it is as if the creators are expressing their own frustrations through Mysta. 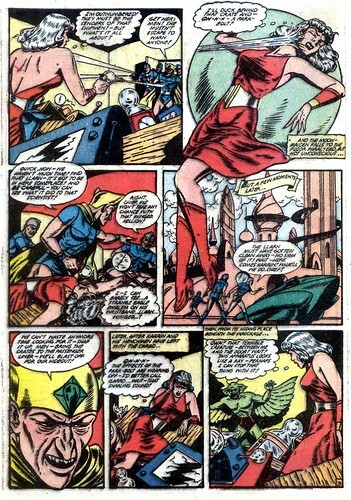 But it is as a fan and not as a critic that I read Mysta and the other heroines of Planet Comics. As a reader of these Golden Age tales I am more of a Fan-Editor. In that certain way that comic book fans pick and choose what continuity or behind-the-scenes reality to keep or ignore I apply that same sensibility to Mysta, not allowing the changes at Fiction House that caused the various adventure features to conclude so abruptly. 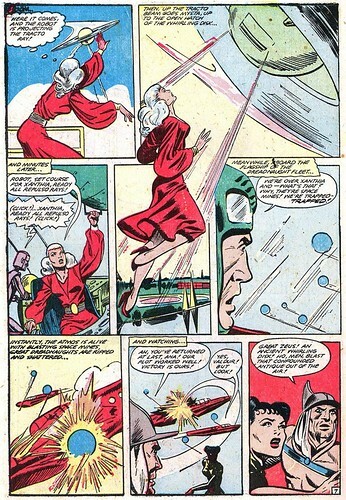 As a fan I can accept that Mysta, seeing no need to continue in her previous role as the final authority on the dissemination of science in a rebuilt human civilization would choose a form of semi-retirement. 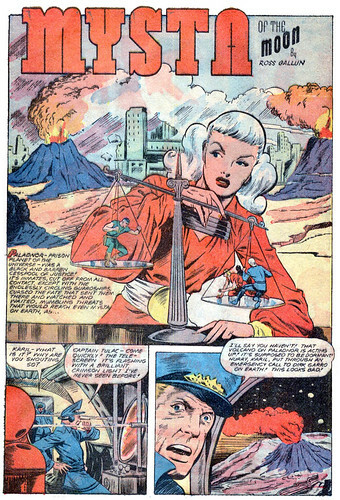 Instead of acting as a wrathful Science Goddess she would keep her hand in, acting as a government functionary while keeping watch via the Science Council. In abandoning her fortress on the moon Mysta is allowing humanity to once again control their own destiny and perhaps discover a new one of her own as well. 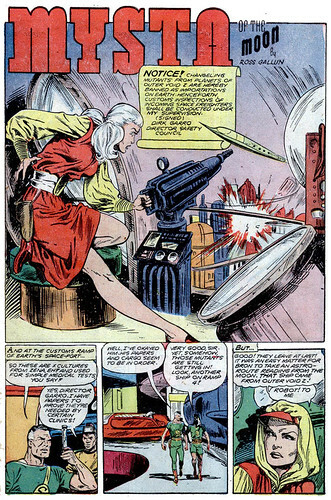 Mysta and the other Golden Age characters of Fiction House would vanish into obscurity until revived in the 1980s for a short-lived effort by Paragon Press called The Star-Fems, a time-tossed team of space-based heroines. 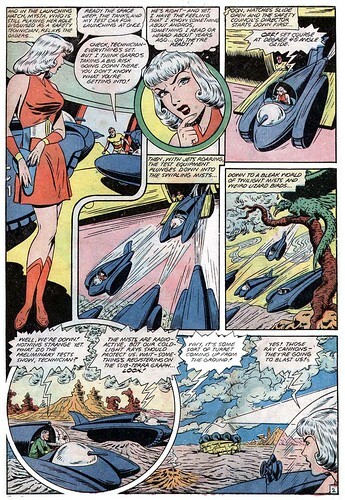 You can find more info about the team and read the 1980 adventures of Mysta of the Moon, Futura and Gale Allen here: The Star Fems. 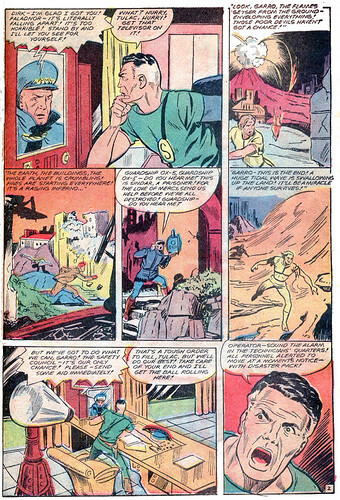 Planet Comics #61 (July 1949) is the second to last original Mysta of the Moon story to appear in the long-running science fiction comic book. 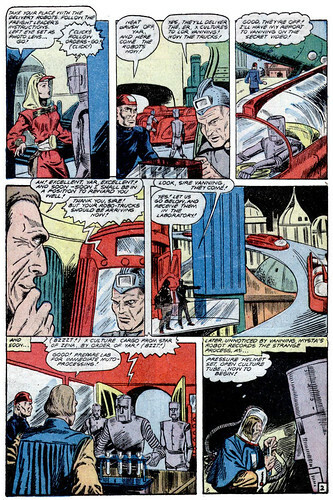 In this chapter Mysta again aids the Safety Council against a gang of criminals with access to advanced technology. There isn’t any politics involved to speak of and the criminals appear to be simple thugs out for a payday. One questions how inexpensive and available the technology is to allow criminals to transport and enlarge small creatures to giant size. It must be common knowledge and fairly economical at this point because Mysta has had to deal with tyrants and crooks using size-changing science several times over the course of her career. 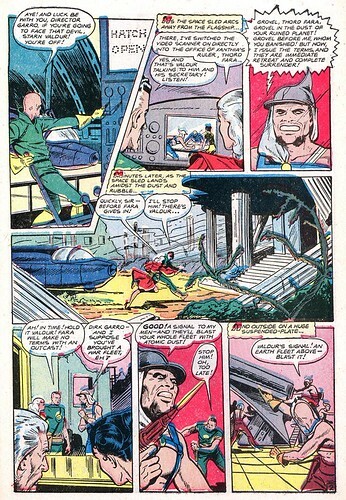 Assistant Bron appears once more and again reveals his dissatisfaction with his lonely exile to Mysta’s fortress moon. Having been released from a prison colony to spy on Mysta his life has surely been extended by improved conditions but Bron is still in a prison of sorts. Mysta certainly knows it and has undoubtedly restricted access to many of her devices including spaceships. Bron may not have been an innocent sent to the prison colony and Mysta could be allowing him probation of sorts by remaining on her moon. However lonely and isolated Bron may be the alternative would be to return to a short-lived existence of hard labor. The Mysta of the Moon series is quickly coming to a close as there are only three original Mysta tales left beginning with Planet Comics #60. 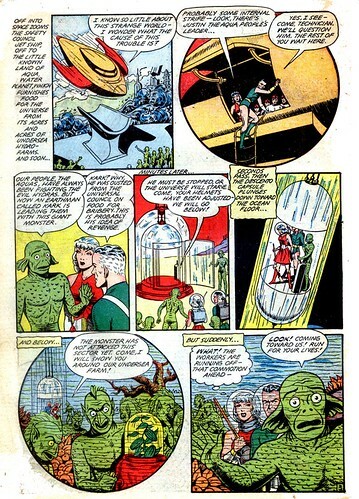 Mysta makes further appearances in issue #61 and #62, with her final showing being in issue #68 as a reprint from #40. 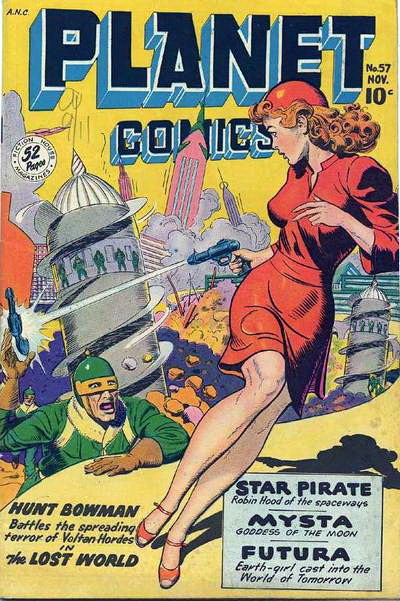 Issue #73 was the final issue of Planet Comics and Fiction House would cease publishing their entire line of comic books soon after. 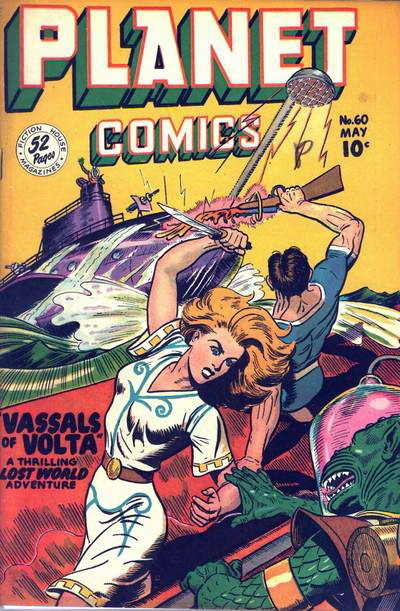 It was about this time in the publication history of Planet Comics that material began to be reprinted. It appears that no new material was being solicited as a cost-saving measure, though whatever serials were already completed ahead of deadline and ready to go to press were published in the months to follow. 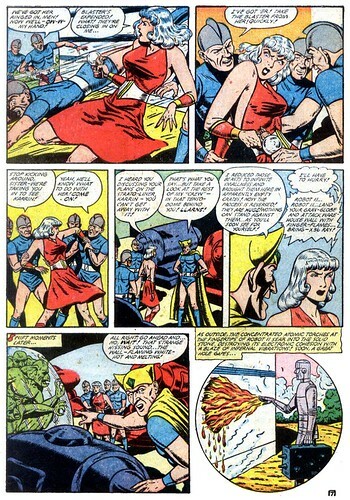 Unlike in the Futura feature which ended a chapter with her being chosen as the leader of a newly liberated planet (Futura – Chapter 22) the various other Planet Comics series do not really have a resolution to their stories. Many of the features had their finale with no notice to the readers and were indistinguishable from any of their previous chapters. Though a non-ending can work if the reader accepts it as with the Futura feature often readers can feel let down by ambiguous endings. 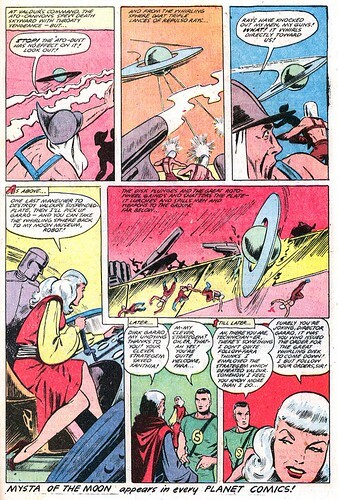 But the ability to successfully conclude a Planet Comics series was probably dependent on if the creative team members knew far enough in advance that their stories would be ending. 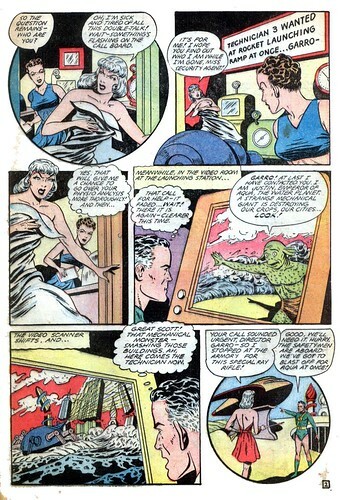 Also, and depressingly so, the possibility exists that given the perceived disposable nature of comic books of the Golden Age it may have been thought by the creators that a fitting climax to the stories was unimportant as they sought continuing employment elsewhere. 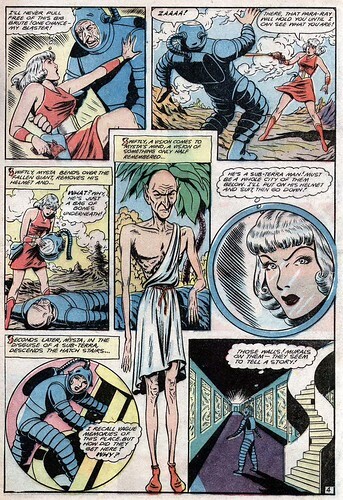 Out of the various characters ending their run in the latter issues of Planet Comics it is Mysta that does conclude with something of a definite sign-off though it is abrupt and is something to be expounded upon later when that chapter is featured. 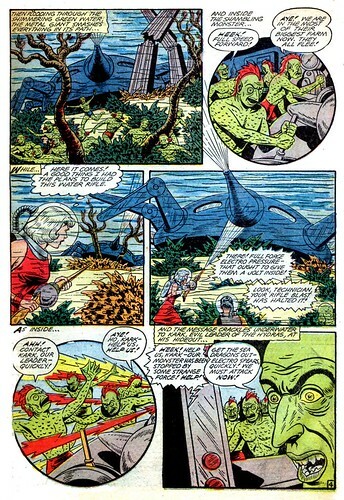 In Planet Comics #60 (May 1949) another mutated race is discovered as they make a play for freedom from their underground existence and threaten those who investigate signals coming from what was believed to be a dead world. Dirk Garro seems genuinely dismayed that there was an entire civilization that needed aid and that no one could help when their ecology failed, driving the survivors underground. I speculate these people were another race abandoned when the interplanetary infrastructure broke down during the Anti-Science wars of years past. In her guise as a technician Mysta aids the Safety Council and again acts less like a computer repair person and more like a Super-Spy. 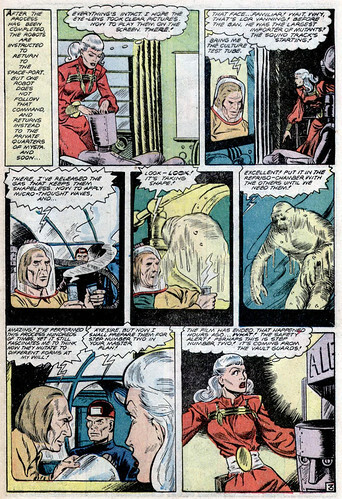 Her performance in this chapter more than any other lends credence to the idea that the ‘technicians’ of the Mysta-verse are all about repairing more than un-jam the fax machine. 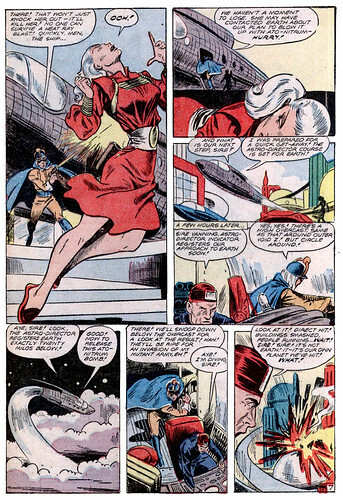 Her entire story this chapter could be easily transplanted into a 1970s Marvel Team-Up featuring the Black Widow. 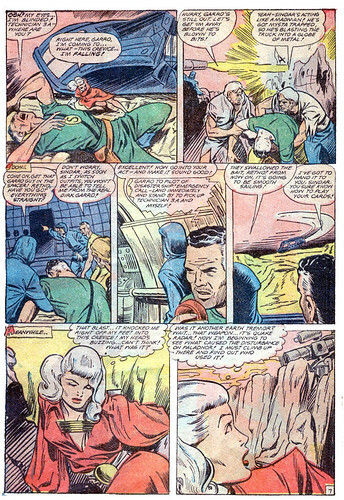 Mysta’s assistant Bron finally makes a re-appearance in the 24th installment of Mysta of the Moon from Planet Comics #59 (March 1959). While Bron remains stranded on her fortress moon with her robot for companionship Mysta remains undercover as a euphemistically-termed Technician for the Safety Council. Bron acts less disgruntled in his scenes and appears more or less resigned to being exiled to a long-distance professional relationship with his mistress. When an outlaw uses forbidden weapons to attack the planets in a bid for power Mysta recalls the Spinning Disk from Chapter #21 back into service. Interestingly, Bron refers to the disk or at least the area in which it was stored as having been unattended for some time. 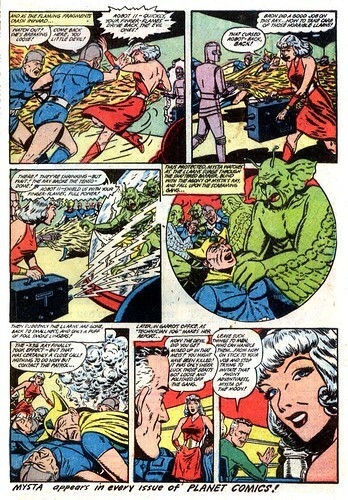 It is hard to define how much time passes in the Mysta-verse between chapters since the continuity of Golden Age stories is sketchy at best. There is no telling how old Mysta is either since she probably has access to advanced medical technology that extends her lifetime and vigor that other are not yet privy to. Rebuilding human civilization from ashes could have taken decades thus far. 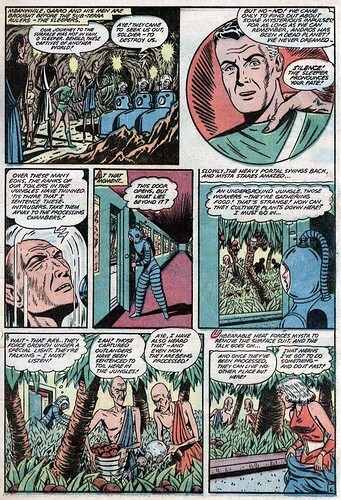 I would speculate that just removing the anti-intellectual influences from the various cultures would have taken several years of Mysta-meddling and ultimatums after the alien Mars destroyed all knowledge. I would liken it to modern America trying to leave in the past the superstitions that create so much unrest in some political parties and backwards regions. Though I’m sure that the lack of basic services and a food supply may have hastened Mysta’s efforts to rebuild. 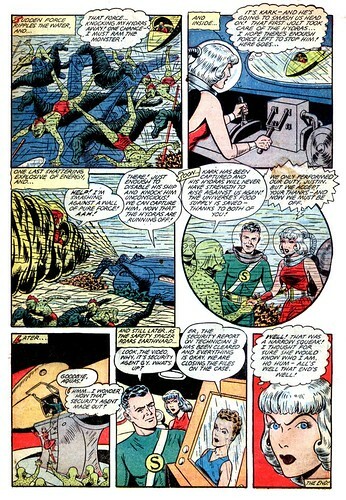 The citizens, wondering where their next syntho-meal would be coming from, would likely have no problem accepting science to provide for them if Mysta dangled it out in front of them. 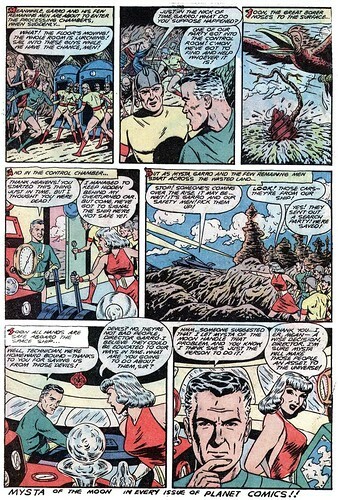 It may have been one of those situations where Mysta declared the people could listen to the idiot telling them science is evil and starve or fall in line and get electricity and running water restored before the next cold snap. 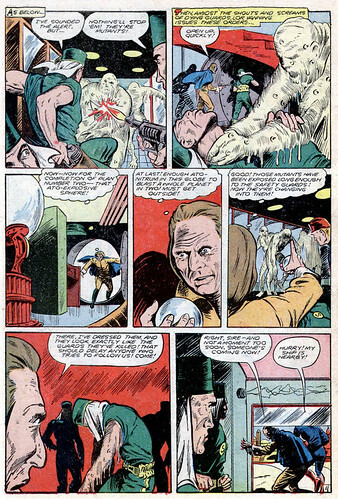 Matt Baker is once again credited with penciling this chapter. 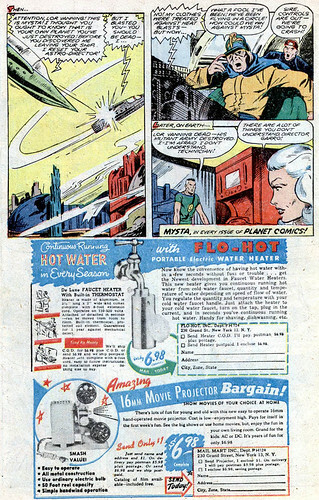 Planet Comics #58 (January 1949) gives readers a peek into Mysta’s former involvement with the governmental authorities as a menace from her past returns. When Mysta “convinced” the collected worlds of human society to disarm the opportunistic thief Sindar stole plans for forbidden weapons. He planned to build them on his own and use them to take control of a newly rebuilt and vulnerable civilization. 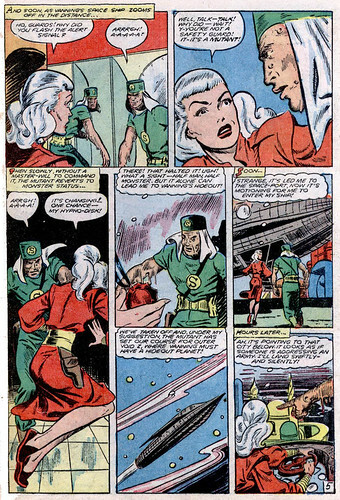 Sindar was sentenced to exile on a prison planet by Mysta, who apparently had some say and position of power in the government. Whatever position Mysta maintained in the government she seems to have relinquished it in favor of a consulting or behind-the-throne role, remaining and monitoring humanity from her fortress moon. The prison world may have been the same one that the impostor Bron was freed from previously to spy on Mysta. It is interesting to note that the plan of replacing a person of influence was again attempted albeit of a much more publicly known individual. When Sindar escapes from the prison planet and threatens the peace Mysta again aids the Safety Council, continuing to act undercover as a technician. The term ‘technician’ may have a different meaning than a mere repair person as the agents seem to operate with a great degree of autonomy during crises. That the technicians seen thus far are mostly female and live in Safety Council headquarters may only mean that they are housed by gender as highly-skilled on-call operatives who maintain a ready and able force that responds and deploys at a moment’s notice, like firemen or military squads do today. Mysta does not seem to get along with the other technicians, though and they are highly competitive and threatened by the newcomer. 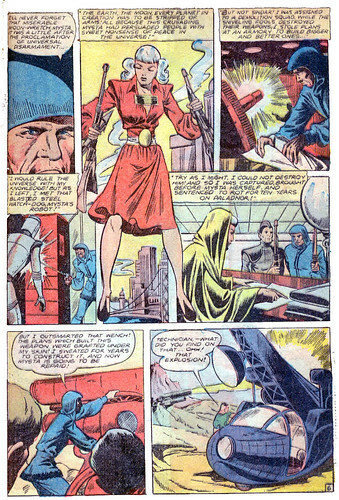 Interesting politics are on display in Planet Comics #57 (November 1948) as Mysta becomes involved in economic warfare against shape-shifting mutants. 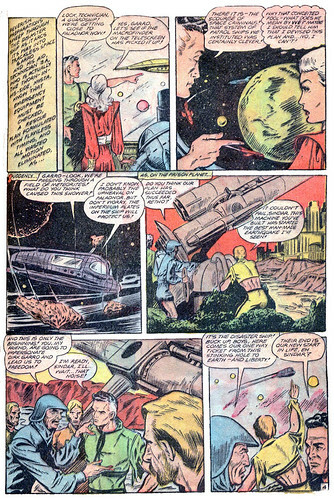 The Science Council is again absent in this Matt Baker penciled tale and the Safety Council remains as the representative administration for Earth presumably controlling the application of potentially dangerous and destabilizing renewed sciences. When an outer planet is denied the importation of its adaptable and non-sentient workforce the leader does not take too kindly to the economic blockade and makes plans to invade Earth using drones that can assume the shape of any human. While the mutant drones could be a boon to industry they are also a clear and present threat to the security of any world. The drones represent a technology that could be used by the smallest group or individual with access to some funds and technology. Special interests threatened by a cheap, adaptable labor force are probably also putting pressure upon the Safety Council or whatever body governs the planet to ban their import. 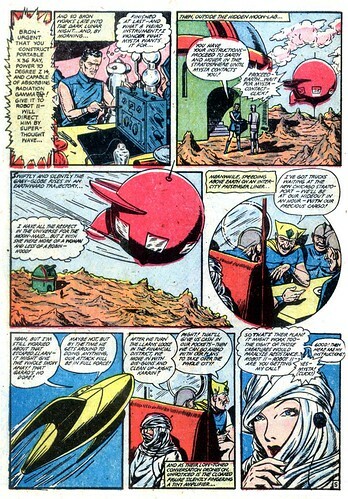 Assistant Bron is absent entirely from this chapter and is presumably marooned on Mysta’s distant fortress moon. Mysta, remaining undercover as a competent yet mouthy technician in the Safety Council headquarters intervenes with the terrorist plot by the leader of the blockaded world. 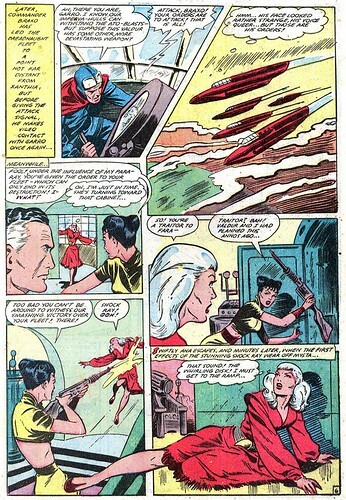 Unfortunately, Mysta also practices the bent for genocide that Fiction House heroes are known for as she tricks the leader into destroying his own planet with nuclear weapons. This could be excused as the cost of war. However right or wrong economic and security policies instituted by Earth had fomented a war. 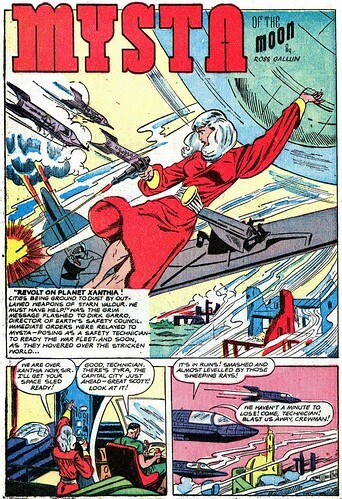 While in the past Mysta had usually acted at the will of or grudging acceptance of the Science Council this time she acted on her own after judging that the technology to wage nuclear war and infiltrate other planets was in the control of someone she did not see fit to wield it. 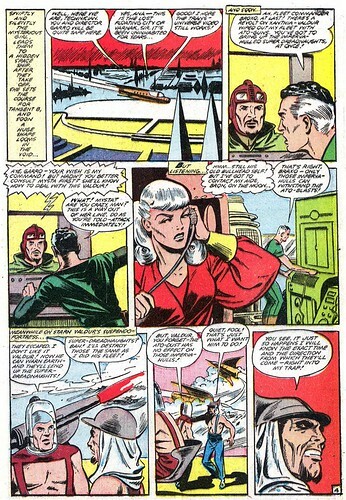 Though the outcome may have been the same if the Safety Council was involved Mysta took a decidedly singular action and ended the conflict by destroying an enemy’s infrastructure and ability to deploy their weapons for the foreseeable future.